If you’ve followed my Star Wars Countdown event, you’ll know that I’m a bit of a fanatic. (Okay, maybe more than a bit!) I mentioned in my previous posts that there were some fabulous giveaways coming, and I wasn’t kidding! When I saw this prize pack from DK Books, I knew all my fellow Star Wars fans out there would love it too! After reviewing Star Wars: Absolutely Everything You Need To Know (and loving it), I can guarantee that this set will blow you away! This is the quintessential set for any die-hard Star Wars fan and would make an amazing holiday gift. 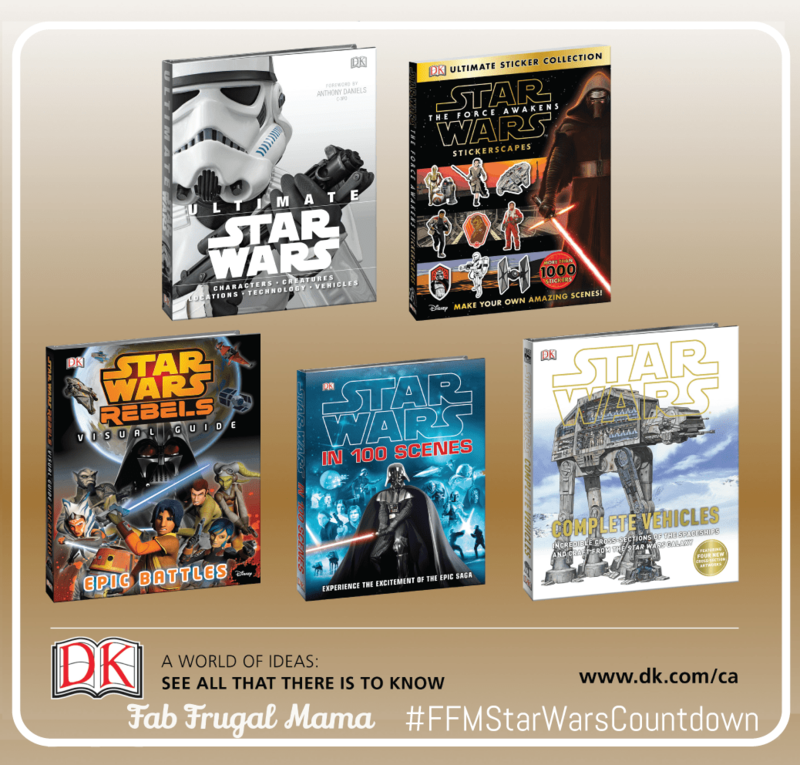 Click here to check out all of the amazing Star Wars books from DK Canada! There’s something for every age range and reading level – from Lego-themed stories and sticker collections, to books that adult fans will find drool-worthy (#awesomegifts). Enter below for your chance to win this set! Contest is open to Canadian residents, 18+ (excluding Quebec and Nunavut). Full contest terms are noted in the Rafflecopter form. This is the first of three awesome Star Wars giveaways, so stay tuned for the others coming soon. I think my son would like the Star Wars: The Force Awakens Stickerscapes!! Thanks! My husband is a die hard Star Wars fan, he would love this! My favourite is the Star Wars: The Force Awakens Stickerscapes book because I think my son would like that one best! Thanks for the giveaway! My top pick would be the Ultimate Star Wars book, since it is, after all, the Ultimate. I really would love to win these gorgeous books! Wow , would my grandson LOVE this ! The Ultimate Star Wars book is my favorite in the collection. Ultimate Star Wars book is the one I am most interested in. Star Wars: The Force Awakens Stickerscapes, my nephew would have fun with this. He is just getting into Star Wars. Hubby would love the Ultimate Star Wars as the write up said “Become an expert on the Star Wars galaxy! Ultimate Star Wars® is an in-depth visual feast exploring the characters and storylines from the Star Wars galaxy” Then he would know so much more on it! The Ultimate Star Wars…love to know more about all of these movies! My son like the Star Wars in 100 Scenes. Ultimate Star Wars looks good. the guys here would love it! there is a houseful of people that would devour these books! My son loves them all! The Complete Vehicles book looks awesome!! I may read it before I give it to my 7 year old….. The Ultimate Star Wars book would be our favourite. My favorite is the Ultimate Star Wars! “Star Wars in 100 Scenes” is my fave. The Ultimate Star Wars looks pretty cool! I think the Star Wars in 100 Scenes book would be my top pick. My son would probably love the sticker book! I think my son would get most excited about the sticker book! My favourite is the Ultimate Star Wars book. Complete Vehicles!! I know a perfect classroom for this! I would pick the Ultimate Star Wars. My nephew is a major fan of the Star Wars series and would love these books! My two 6-year-olds would love the stickerscapes. Not sure what it is about stickers but they love them! Thanks to the Sponsor for giving and you for hosting. Would love the Ultimate Star Wars book for my son! My favourite is the Star Wars: The Force Awakens Stickerscapes book because I think my son, Oliver, would love it! Star Wars Rebels: Visual Guide! Oh the Ultimate Star Wars looks like a great book! I would like the sticker book! Cool! The Ultimate Star Wars would be awesome! Star Wars: The Force Awakens Stickerscapes is the one I like best.